Implementing the Common Core State Standards (CCSS) brings many shifts to elementary classrooms, and one of them is the increased emphasis on informational and nonfiction texts. I’m sure it isn’t news to educators that the language arts standards call for elementary curricular materials with a mix of 50 percent literary and 50 percent informational texts. Predictably, there are mixed reactions to the CCSS mandate. I’ve read articles and educational blog posts indicating that some people perceive the shift as a disregard for the importance of stories and poetry on children’s development. While others have responded with a sigh of relief, citing the reasons why it’s important to provide expository and nonfiction texts in early grades. No matter where your personal opinion falls, I’m certain we agree that being able to critically read informational texts is an essential skill. The National Forum on Information Literacy defines information literacy “as the ability to know when there is a need for information, to be able to identify, locate, evaluate, and effectively use that information for the issue or problem at hand.” Sadly, some 44 million Americans can’t extract information from text in many circumstances. That estimate, from a 2004 presentation by University of Michigan professor Nell K. Duke, is likely higher today. Like all illiteracy statistics, the figure is disturbing. While there’s never one reason for such a statistic, mandating access to nonfiction and informational texts in elementary grades is a step toward lowering it. Although Great Books K–12 programs emphasize developing reading and critical thinking skills by working with high-quality literature, we don’t perceive the new 50/50 requirement as a challenge to the importance of fiction. We recognize that students need to read a large variety of texts to learn strategies for content reading in the upper grades—this will help them grow into more literate adults—and any mandate increasing time spent reading in the classroom is a positive. But it isn't enough to provide access to nonfiction and informational texts; quality is equally important. Students need texts that have descriptive details, an enthusiastic voice, clear organization, and an appealing design. How do teachers decide which books to provide their students? How can they quickly discern which are high-quality texts? We created our new Junior Great Books® Nonfiction Libraries for grades 3–5 to make the choices easier. Each library contains 30 titles selected by Foundation editors, including science and social studies books, as well as Common Core informational exemplar texts. Using the same high standards for choosing selections for Great Books programs, Foundation editors selected texts that are engaging, age-appropriate, and substantial. Our nonfiction libraries will help teachers dig deeply into topics like science, social studies, and history. Titles such as “Boy, Were We Wrong About Dinosaurs!,” The Cloud Book,” and “Quest for the Tree Kangaroo: An Expedition to the Cloud Forests of New Guinea,” are ideal for independent science reading. Each library comes with a teacher’s guide with optional activities for student response and sharing, its own bin, and stickers for each book to keep the library organized. Quality materials are an essential component to meeting the demands of CCSS. Teachers have enough work to do without the additional burden of searching for suitable texts. 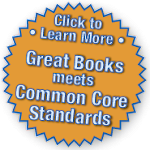 Let us help you implement CCSS in your classroom with nonfiction libraries that meet the high standards Great Books teachers have come to expect. Our new Junior Great Books Nonfiction Libraries will be available in late October. Sharon Crowley works in K-12 marketing at the Great Books Foundation. She's celebrating Banned Book Week by rereading her favorite often challenged book "To Kill a Mockingbird."